ALPHACAM is one of the leading and most established suppliers of CAD/CAM software for the stone industry. 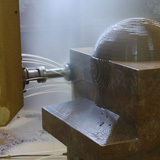 ALPHACAM Stone has been specifically developed to address the unique challenges encountered when machining marble and stone. From CNC machining simple kitchen worktops to complex three dimensional stone carvings, ALPHACAM Stone is the tool of choice for the modern stone craftsman. 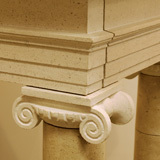 2D and 3D geometries can be either created or imported into ALPHACAM Stone. TRADITIONAL formats such as DXF, DWG and IGES are all supported, as well as the new generation of solids, such as Parasolid. STL files, a common file format in the industry, especially when using laser scanners to copy existing hand carved forms, can be easily imported, manipulated and machined. 2D geometries can be contoured using any shape or size of tool. The profile of form cutters are created within the system and their effective diameter and programming depth point controlled. 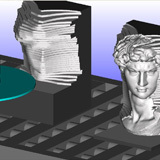 The subsequent profiles generated by these tools on the parts are displayed graphically using the advanced solid simulation available within ALPHACAM Stone. Tool radius compensation is fully supported and a tool lead-in and out easily created. This means that the entry and exit points of a cutter can be controlled, often required if a tool needs to plunge at the centre of a previously core drilled hole. The lead-in and out can be sloping, reducing tool wear and be either; a line, an arc or both a line and an arc. An overlap can be introduced to ensure that no cutting witness is left at the start/end of cut. Contouring is used extensively when machining and polishing the mouldings found on the edge of granite kitchen worktops. By supporting tool radius compensation, the diameter of the tool can be adjusted on the machine controller, thereby allowing for tool wear. When cutting and polishing a contour, multiple tools need to be used. 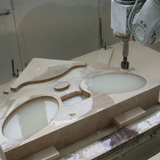 This is achieved within ALPHACAM Stone by creating a machining style. 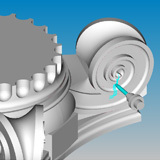 A machining style is a combination of one or more operations saved away under a unique name, this style can then be applied to any geometry. This avoids the repetitive work needed to apply similar machining operations with numerous tools to the same geometry, thus reducing time and avoiding costly mistakes. Elliptical and circular surface polishing strategies allow top and recessed surfaces to be finished. Full gouge detection is always active, though a negative stock is available to allow the polishing tool to overlap the top edge of surfaces when required. Surface polishing also involves multiple tools to achieve the surface finish required and again lends itself to the use of machining styles. A closed geometry can be pocketed (recessed), with an unlimited number of closed geometries (islands) left standing within it. ALPHACAM Stone has full look ahead; this means that the tool will remove as much material as it can without gouging (fouling) the part. If a pocket is incomplete because the tool used is too large, a smaller one can be subsequently selected to remove the material left. ALPHACAM remembers the residual material and pockets only in these areas, rather than retracing the path followed by the first tool, cutting ‘fresh air’ and therefore saving time. A helical tool path can be used to plunge the tool into the part at the start of the cut, if required due to the nature of the material being machined. 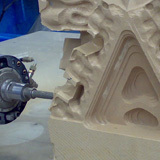 Core drilling within ALPHACAM Stone is fully supported. Breakout on the underside of worktops can be controlled to prevent edge chipping of the material. Roughing of both 2D and 3D cavities, using a core drill, can be automatically generated. This includes interruption of the machine tool when the maximum depth of cut has been achieved by a core drill, allowing the operator to safely enter the machining area and remove the resulting material pillars, before restarting the program. If a profile is required around a contour or pocket, 2.5D machining is available within ALPHACAM Stone. Rather than using a form tool, a 2D profile or draft angle can be cut using a flat or radius tool by driving the profile around a geometry. The tool then follows this geometry, in multiple depth passes, moving out and down as it goes, in order to generat the profile. This is a very efficient way of machining, because as the tool is only moving in 2-axes at any one time, G2/G3 arc moves can be supported. 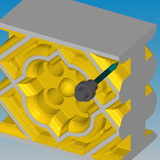 This machining technique is used to rough out a profile before using a form tool, thus avoiding any unnecessary wear and stress on it, or sometimes eliminating the need for an expensive form tool altogether. One of the most powerful tools available on a CNC stone cutting machine is the disc, ALPHACAM provides disc cutting functionality unrivalled by any other CAD/CAM system. Profiles can be machined around contours, such as mouldings on the side of fire place surrounds, using a disc either horizontally, vertically, or normal to the profile. The programmable safety guard around the disc can be defined within ALPHACAM Stone and automatically controlled, to avoid any fouling of the part. As well as finishing a profile, all the excess material is also roughed away. Parameters such as width and depth of cut can be controlled, as well as the lead in and out safety distance of the disc. When roughing the profile, to ensure that the blade is cutting using its full width and therefore avoiding unnecessary stresses, a width of cut greater than the blade can be specified. The machine tool can then be interrupted, allowing the operator to break and clear away the vanes, left before finishing commences. When finishing a profile, it can be cut with the side of the disc, either vertically or horizontally and by a given step length. Discs can also be used to rough or finish machine 3D surfaces and STL files. 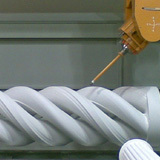 This technique is often used to machine the curved underside surface of stone spiral staircase treads. Multiple 3D roughing and finishing strategies are available within ALPHACAM and used extensively when machining large STL files. Tool path step length and chord error can be easily changed to control surface finish. The tool axis of resulting paths can be converted and driven through a fixed focal point or drive curve(s), to give effective 4 and 5-axis simultaneous machining. When using 4 and 5-axis machine tools, all of these cutting techniques are supported during planar machining. Often referred to as 3 plus 2, because the 2 rotational axes of the machine are used to orientate the machine head into position, then locked and fixed for rigidity, before 3D machining commences using the remaining 3 linear axes. This allows for areas of a part to be machined which would otherwise be inaccessible, were a conventional 3-axis machine used. Art work can be digitised and text can be easily sized and wrapped around a base geometry for sign and grave stone machining. Conical shaped tools, either with a flat bottom or point, can be used to 3D engrave any art work. 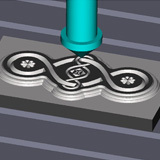 This machining technique is similar to contouring, apart from when the tool comes to a point, at which time it pulls out of the part towards the point and then back again, leaving a sharp corner, often referred to as embossing. Any 2D toolpaths generated, including art work, can be projected onto a 3D surface, allowing the tool to rise and fall with the form. The projection of tool paths is fully supported up to and including full 5-axis, in which case the tool can also be kept normal to surface. Powerful post processing capabilities mean that all the advanced functionality of a CNC controller can be supported, including plane rotation. This allows for tool radius compensation and arcs to be used at any angle which dramatically reduces the amount of NC code required, smoothes machine movement and improves accuracy, as tool size and wear can be compensated for on any plane.